NB: Proffered as part of Friday's Forgotten Books, 25/4/14. to a Walter King-Welston (I think – it might be King-Welsh), who, given that the book came from The Bookshop in Wigtownshire, was probably a resident of that south-west Scottish county – as was Hubbard himself from 1973 (when he moved there from Dorset) until his death in 1980 (see Tom Jenkins's Mystery*File article on the author). I've not been able to find out anything about King-Welston (or King-Welsh), but the inscription is dated 1975, which means Hubbard would have been living in Wigtownshire for two years by that point, so it would be reasonable to assume he and King-Welston were acquaintances – and furthermore, since the inscription is in an American edition rather than a British one, that the book was one of Hubbard's own copies which he gave to King-Welston (as he did with A Thirsty Evil to Alan Kennington, and indeed as spy novelist Anthony Price did with a US edition of Our Man in Camelot to me). If that is the case, a book set in Scotland – albeit the north rather than the south-west – would be a fine thing for an author to inscribe to a fellow resident of Scotland, especially a book as beguiling as The Whisper in the Glen. 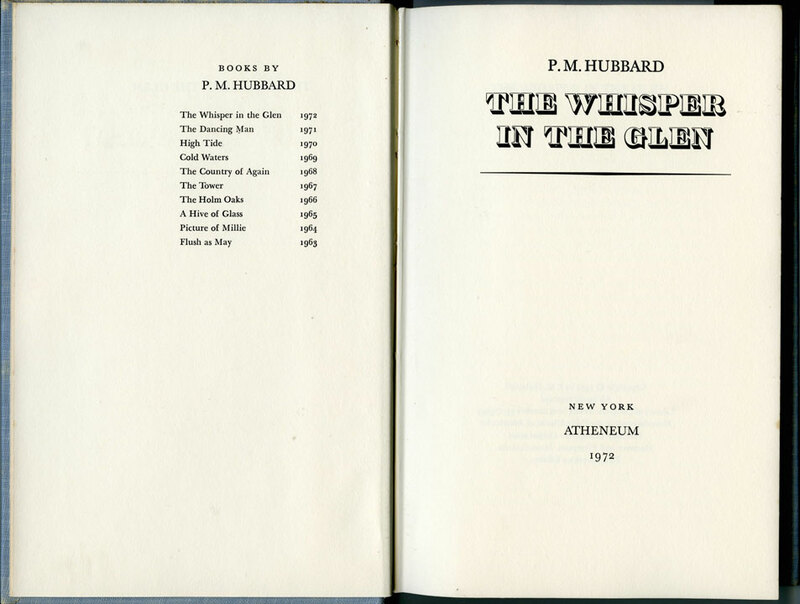 That said, it's a curious work in Hubbard's canon – not so much a novel of suspense as the dust jacket has it – and as the majority of Hubbard's novels arguably are; more a kind of gothic romance, although still characterised by the author's abiding preoccupation with the rural and the wild, in this case the by turns breathtaking and forbidding Highlands. 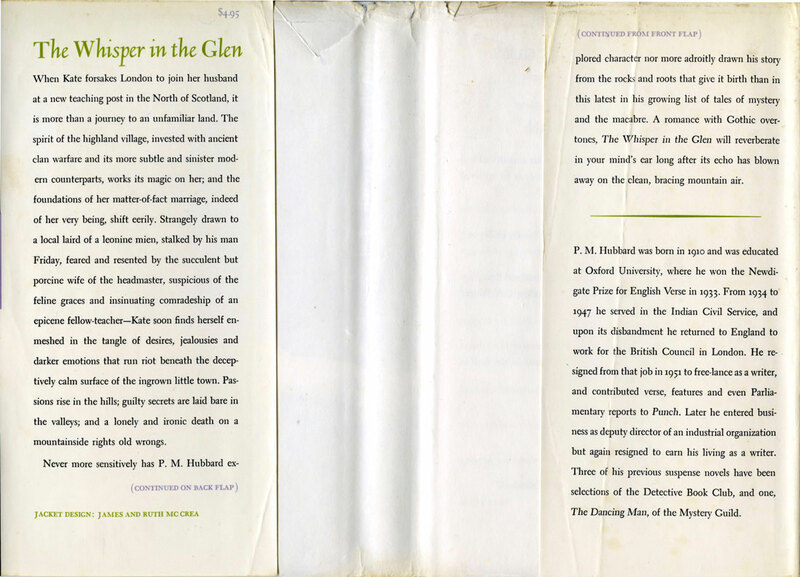 It's here, to a house in the grounds of a private boarding school, that the novel's protagonist, Kate Wychett, is transported by her teacher husband, Richard; and it's here that Kate finds herself entwined in the local bush telegraph – the "whisper in the glen" of the title – and entranced by the laird of the manor, James Macalister. Mostly she kept her eyes down on the rough going, but every now and then she looked up ahead of her, hoping to see the rock. She had still not seen it when she saw whisps of mist on the path ahead and the outline of the hilltops already blurred. It was very dark, as dark as it could be at that time of day. She was a little desperate now, and almost running, so that when it happened she could hardly stop herself. The light changed suddenly from a leaden dusk to a luminous phosphorescent grey, but now there was nothing to see. The world contracted in an instant to a few yards of broken ground under her feet. Beyond that and everywhere above it there was nothing but the seething mist. The voice of the burn went on. It seemed louder than ever, but she could not see where it came from. It was not only the shadow of the cloud-bank that had caught up with her now. It was the cloud itself. All this seems somehow haunted by the death of Kate and Richard's only child, Julia, some years past, a shattering event mentioned matter-of-factly at the beginning and the end of the novel, perhaps symbolized by the totemic black rock (shades there of the sinister submerged rock in A Thirsty Evil) set into the hillside where Kate encounters James, which in turn is central to the burning passion which threatens to engulf the two of them; it's no accident that the sole act of violence in the novel occurs in the shadow of that rock. 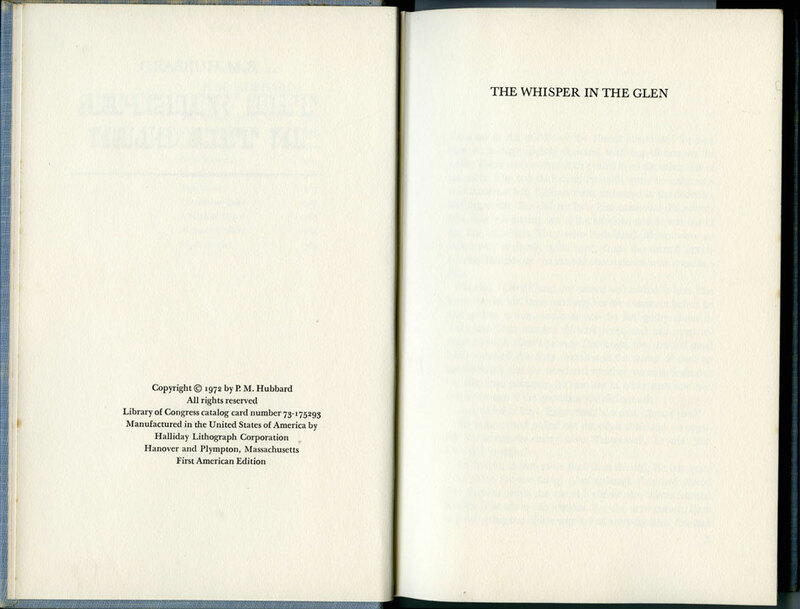 The Whisper in the Glen is a quietly remarkable novel, as good in its own way as A Thirsty Evil or A Hive of Glass. The more I read of Hubbard the more astonished I am that he isn't better known; he has something of Geoffrey Household about him in the way he steadily builds suspense in his novels and in his rustic fixation, but he's also (like Household) quite unique – an original. Accordingly, inveterate collector that I am, it's immensely satisfying to own two signed Hubbard books – the only two I'm aware of – even though I can count on the fingers of one hand the number of fellow Hubbard enthusiasts who might appreciate such a thing (hello, Book Glutton, John and Polecat). Since I'm on the subject of P. M. Hubbard, I believe I'll take a break from the signed books I've been blogging about of late and turn instead to some of the other Hubbard books I've collected since I last wrote about him, starting with an incredibly scarce edition of his debut novel. And hello back to you, Nick. Nice catch, my friend! Speaking of "incredibly scarce editions of his debut novel" -- I finally found and purchased a copy of PICTURE OF MILLIE. The US edition, that is, with the Edward Gorey illustrated DJ. I was elated when I found it. Only cost me $65. A steal, I'd say, for a scarce copy in such excellent condition. Where'd you snag this signed copy, you devil? If it's one of your trade secrets then don't feel obligated to answer. But, of course, as another rabid Hubbard collector I am DYING to know. Excellent, glad you found Picture of Millie, John. Have you read it yet? 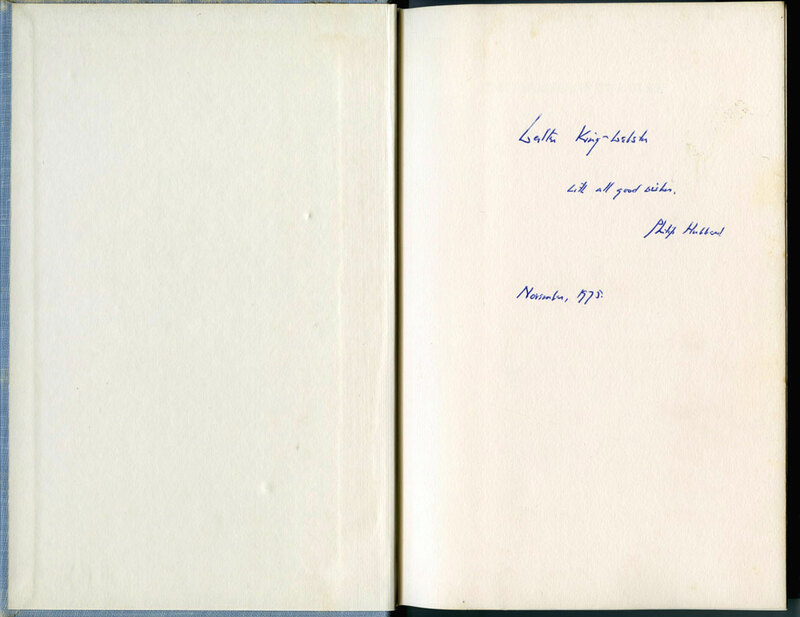 No trade secrets with this one: it was sitting on AbeBooks! I just checked my copy, which I had always been very happy with because it looks nice, and it turns out it is a second printing from June 1972. And the dust jacket has been price clipped. I can't stand the sight of it anymore. 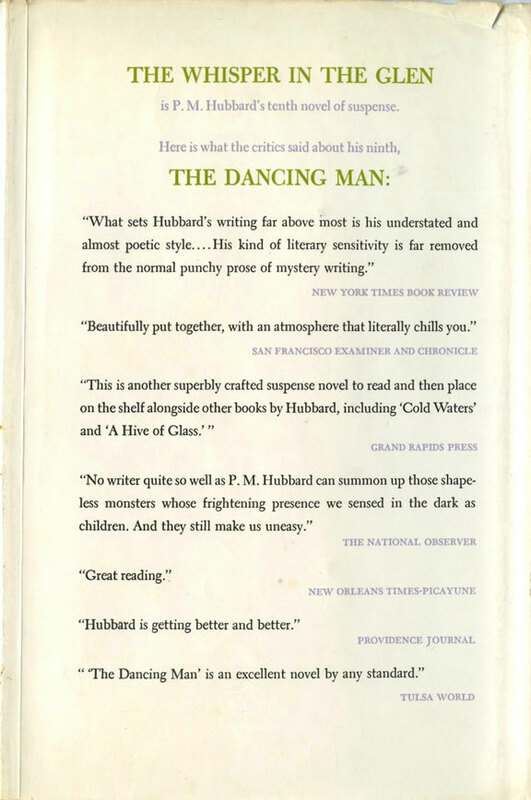 Also - I discovered Hubbard through a Forgotten Friday review of High Tide several years ago. Nice to see you recommend him in that same series. 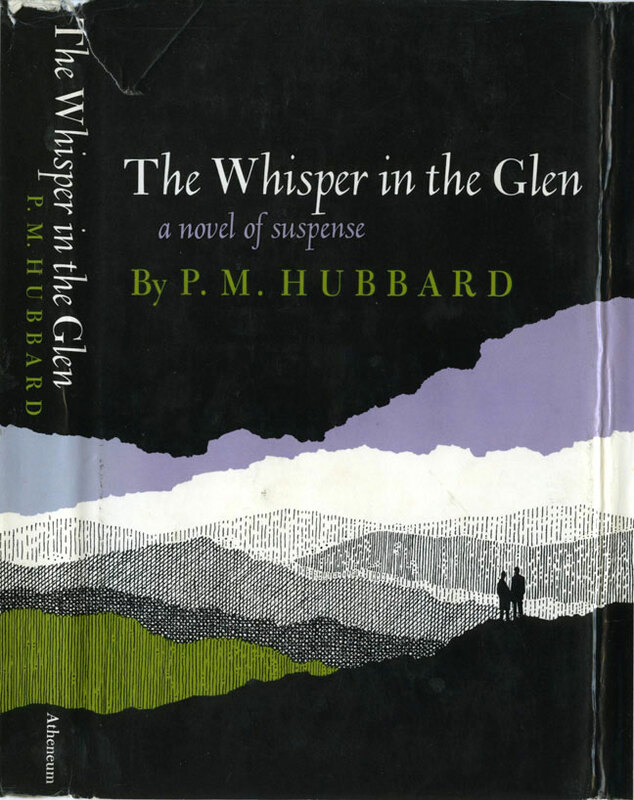 I hope people read your review of The Whisper in the Glen and start to read Hubbard. Ah, but until you commented, BG, I had no idea the Atheneum edition went into a second printing; so while it may be disappointing to you, your copy had proved bibliographically germane.